In this article, we explore two extremely powerful ways to visualize text: word bubbles and word networks. These two visualizations are replacing word clouds as the defacto text visualization of choice because they are simple to create, understandable, and provide deep and valuable at-a-glance insights. In this post, we will examine how to construct these visualizations from a non-trivial corpus of news and blog RSS feeds. We begin by investigating the importance of text visualization. Next, we discuss our corpus and how to wrangle it. Finally, we will present word bubbles and word networks. The most interesting data is often unstructured text in news articles, blog posts, emails, Twitter posts, log files, and countless other publications. However, as the amount of data grows, the task of applying analytics to extract meaningful information from the data becomes more challenging. While there is a lot of valuable information to be extracted from such data, it is not natively in a computer understandable format, which makes it difficult to present insights while keeping the natural narrative intact. Modern text visualization provides a solution to this challenge. Text visualization takes a media that we're very familiar with — language, and transforms the flood of information into a snapshot of the data that is more easily interpreted than painstakingly reading through hundreds of documents. David McCandless, a London based data journalist, gave a TED Talk entitled “The beauty of data visualization.” In the talk, he noted that our sense of sight is the fastest of the five senses and that the “eye is exquisitely sensitive to patterns in variations in color, shape and pattern.” He goes on to say that combining “the language of the eye” and the “language of the mind” provide a powerful combination to gather insights from data. How to acheive a similar high quality "of display with text is an open question," Hearst states in Search User Interfaces. She continues, "Placing nominal data like words or names along an axis, unfortunately, is much like scrambling the years in a plot of change over time....Unfortunately, because text is nominal, many attempts to visualize text result in nonsensical graphs..." Through our two visualization suggestions in this post, we hope to present instructions for clear alternatives to summarize corpus content. In order to demonstrate the effectiveness of text visualization, we have provided some examples of visualizations of an analysis on a non-trivial corpus. The source of these analyses is the Baleen corpus, a service that ingests news and blog posts from RSS feeds on a daily basis. The service has been collecting feeds since March 3, 2016 and has more than 52,000 articles in HTML format. The feeds span a variety of categories including news, politics, business, tech, and cooking. The following dendrogram chart shows the categories and feeds that are ingested into Baleen. Posts - contains details about the articles that were ingested, such as the feed that they belong to, URL, HTML content, publish date, etc. For the purposes of this post, we will focus on the feeds and posts collections. If you would like a snapshot of the Baleen corpus, please request it via direct message on Twitter! The JSON files were piped through Python code using a library called Newspaper to perform basic data wrangling. Note that it is possible to have simply parsed the HTML content in the posts collection of the Baleen database using a package such as Beautiful Soup. However, we chose not to do so because we found Newspaper to be simpler and more effective in parsing HTML content. The parsing step in Newspaper is just one line of code and it worked for the majority of the articles that we parsed. The input for Newspaper is a URL (in this case, the article URL was used). The URL is used to go the specific web page, download the HTML document, and parse the document into a readable text file. The code can be modified based on how the text files need to be organized. Since the early days of text visualization, word clouds have been used exhaustively as a means to represent text data. The idea behind word clouds is to use font size to denote frequency of usage of a given word. However, word clouds are becoming increasingly unpopular among data analysts as interest in Natural Language Processing grows. Jacob Harris, former NYTimes senior software architect, called word clouds “a shoddy visualization” that “support only the crudest sorts of text analysis.” Word clouds are often confusing, difficult to read, and do not help convey any information about the text. The word cloud below haphazardly places text; some words are placed horizontally, while others are placed vertically. The reader has to spend effort to make out the words, which deters from understanding what the visual is about. Some word clouds add color to the words, which make the visual look pretty, but do little else. Rather than using word clouds, we prefer to use word bubbles. 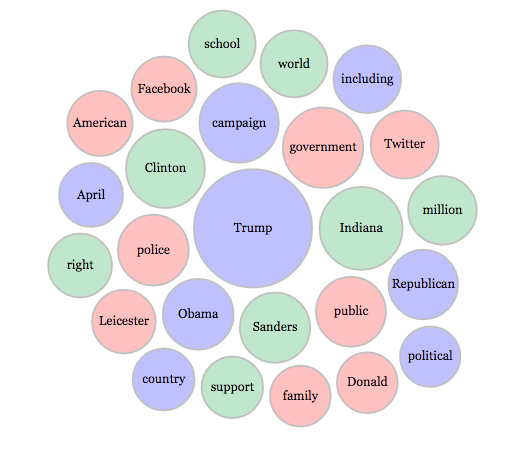 The visual below shows the top 25 words used in Baleen's news feeds in May 2016. The words are enclosed in bubbles, which vary in size based on the word's frequency. The words are all presented horizontally, allowing the reader to focus on the bubble size to make comparisons. In addition, the visualization uses tooltips. A tooltip is a great tool to provide additional information without adding clutter to a data visualization. The reader simply needs to hover over a bubble of interest and the tooltip provides more detail about the data the bubble represents. In this visualization, the word and its frequency are displayed. The bubbles are randomly filled with colors to beautify the image. A potential enhancement to the visual is to use shades of a single color to differentiate between the bubbles. For example, the smallest bubble can have the lightest shade and the largest bubble can have the darkest shade. With this change, both bubble size and color can be used to make comparisons between different words and their usage. The word bubbles are a well-organized alternative to show frequently appearing content within the corpus, but still miss connections between words; therefore, we will explore word networks next. In order to create the network visualization, we use Python’s NLTK library to find the top 30 one-word, non-plural people/organizations using named-entity recognition. Using these entities, we identify similar words from immediate context counts. In particular, if a word appears directly before or after the person/organization of interest multiple times, this is considered a similar word. The created Python dictionary is transformed into a JSON file where each node is a word, which links to a target, colored by group according to the base named-entity. Example code for utilizing NLTK for this purpose is shown below. The corpus was also processed (tolower, custom stopwords removed, etc.) after it was read into Python. The dictionary all_words was later used to create the JSON for d3, which was modelled using this JSON. The network graph should give a more comprehensive depiction of the conversation happening within the text. Using context to link important people and organizations creates an understanding of the content, relationships, and the message within the text. For example, in early May, Leicester City Football Club won the Premier League title. Our network includes “Leicester,” which links to words like “BBC,” “CNN,” “self motivate,” “work,” “Manchester United,” and “streets.” Thus, the network graph tells part of the story of Leicester City, a self-motivated, hardworking team whose title-decider against Manchester United helped them claim victory. The Cinderella story reported both in the UK and in the US sparked celebrations in the streets of Leicester. This force-directed network graph depicts the Baleen corpus as a narrative. Some of the proper nouns relate directly to one another (i.e. "Trump" and "Cruz"). The chart also shows how people and organizations within the text relate to each other through their similar words. Words that are shared by two frequently used proper nouns connect the node clusters together. When the similar word links to two proper nouns, it can show conceptual similarities between two topics of interest. By examining nodes within each cluster, we can gain insight into understanding each word of interest. Through the connections, we can find similarities between each cluster. The code used to generate the network graph can be viewed here. As the scope of what we consider to be data increases, the role of the data visualizer becomes more important. Visualizations must be well thought out, maintaining a self-explanatory story while utilizing a greater number of dimensions. We focus on text data, extracted from the Baleen corpus, to achieve this goal. This was done by combining relevant data from two of the collections from the MongoDB database, outputting the results into JSON files, and using Python’s Newspaper package to convert the HTML content into text. After extracting the data, we created two visualizations. Our word bubble chart uses bubble size to compare frequency of word usage, but also uses a tooltip to display the exact frequency. 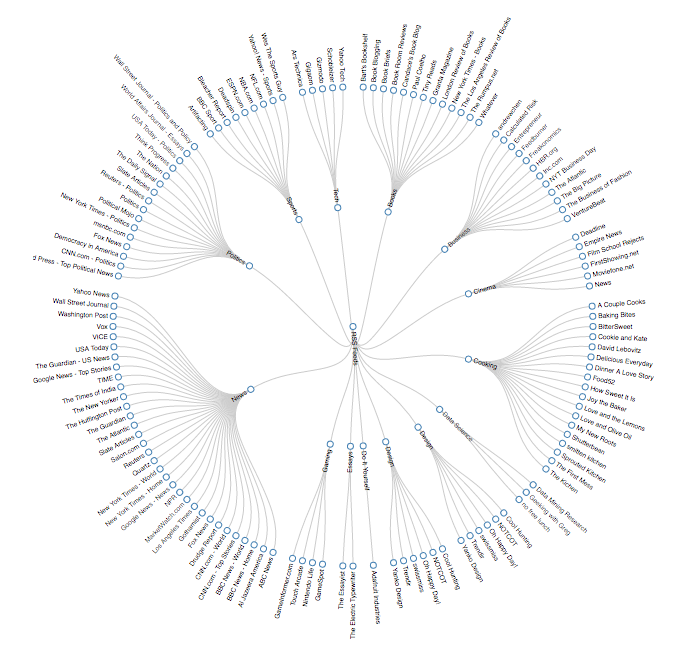 The network visualization shows potential relationships between different frequently used proper nouns in the data in an attempt to visualize the greater conversation within the corpus. 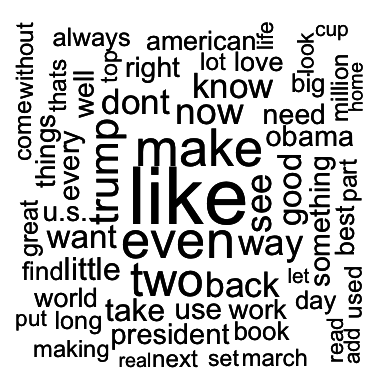 These are just two ways to improve text visualization, to move beyond the word cloud. Need help with data visualizations? Because humans respond to and process visual information better, text visualization can provide better insights for businesses. Schedule a free consultation to find out how we can help!